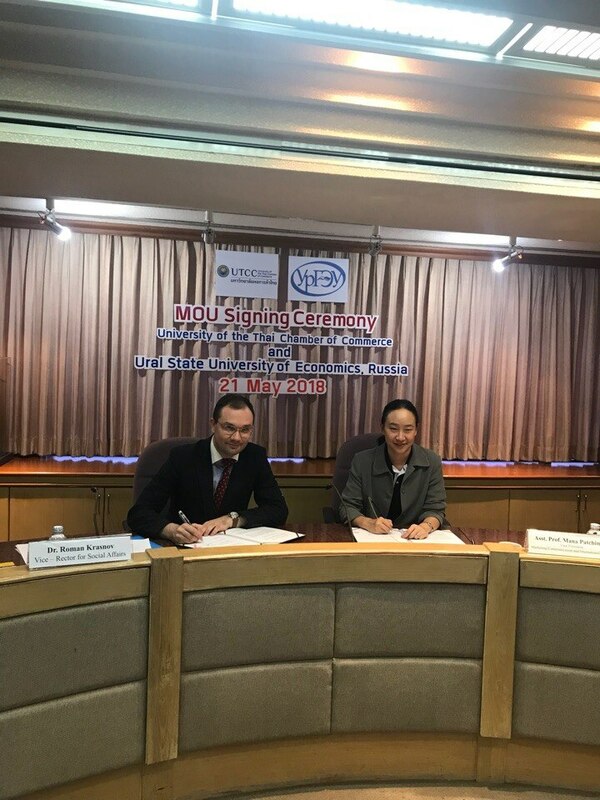 Today, on May 21, the USUE Vice-Rector for Social Work Roman Krasnov took part in negotiations with representatives of the University of the Thai Chamber of Commerce (UTCC). At the meeting held in Bangkok, cooperation in international scientific and educational activities was agreed. The parties discussed the possibility of exchanging students and faculty and training specialists for the tourism industry of Thailand. It is worth noting that the University of the Thai Chamber of Commerce is the largest private university in Thailand. About 20 thousand students from 30 countries of the world study there. UTCC Vice President for International Affairs Dr. Jakarin participated in IX Eurasian Economic Youth Forum at USUE, and this gave an impetus to further development of cooperation between the universities.